Captain Frederick Wentworth shut his cabin door and turned to his first officer. "Harville," he said, "face facts. You cannot bring Susan Kaye to trial. You'd be the laughingstock of the fleet." But Captain Harville wasn't having any. "Impersonating an officer," he said, "is no small crime. She retold Persuasion from your point of view. It's an outrage. Justice must be served." Wentworth spread his hands. "It's not like she's Navy. She's what, Air Force? And not even active. How are you planning to court martial her?" "I'll think of something. Nothing is impossible with fiction." "No kidding," said Wentworth. "After almost 200 years, to have ladies falling in love with Persuasion again..."
"Falling in love with you," Harville corrected. "Portrayed as an unrealistic, sentimental, romance-minded looby." Wentworth smiled. "But I am romance-minded, Harville. And Ms Kaye never wrote me wringing my hands." "A woman, " Harville shot back, "has no business writing from a man's point of view." "She has a brother, remember? And a fleet of rascally step-brothers." "So she worked the flight line on an airbase," Wentworth said. "Dressed in olive drab fatigues and a baseball cap, the only woman on the crew. And the seamen---or whatever they call chaps in the Air Force---forgot she was there. They talked and joked among themselves, like men do. And she took in every word." Harville lifted an eyebrow. "Every word?" "Afraid so. Unless you want your vocabulary expanded, I'd advise against making her mad." "So she's not a girly girl," Harville muttered. "Even so, she's a woman. How do you like having a woman write you?" Wentworth leaned in. "Harville, a woman did! You and I, my friend, are figments of Miss Austen's imagination." "I know what it is," Wentworth said. "I am the romantic lead, and you are the injured sidekick." "The injured married sidekick," Harville grumbled. "No ladies fawn over me! And another thing. Miss Austen tells readers that you're witty and sparkling and all. But does she show you acting like that? Not really. But Ms Kaye does. Page after disgusting page." Wentworth spread his hands. "Do you expect me to object?" "And what does Ms Kaye know about the Navy, anyway? Has she ever been aboard a ship?" Wentworth shrugged. "You ought to read more, instead of building furniture all the time. What you missed by skipping O'Brien and Forester is a lot. And what about that letter?" Harville's eyes narrowed. "What letter?" "You know, the one Ms Kaye had from that captain? A dyed-in-the-wool naval captain, not one of Jane's figments?" "Oh, that fellow." Harville made a face. "Come on, Frederick, the United States Navy? Sissified lollygaggers, that lot." "But he praised her writing and authenticity. And he's not the only man who has." Wentworth punched Harville's shoulder playfully. "What's wrong with you today? Where's your sense of adventure?" "Where's your sense of justice?" Wentworth reached for the cigar box and opened it. "You do realize," he said, offering it to Harville, "that court martialing Ms Kaye will mean a victory for Darcy." Harville nearly spat. "Darcy! My wife goes on and on about him. And her friends. In my own home, with me having to sit by and listen to it. They call it a book club, but I know better." But Harville was not too affronted to select a cigar. "Quit laughing, it isn't funny," he grumbled to Wentworth. "Unless you can think of a way we can court martial him." "Court martial Darcy?" Wentworth's grin grew. "Now you're talking!" "To see him swab decks like a common Jack Tar," Harville said. "What will the ladies say then?" "Nothing's impossible with fiction," Wentworth replied. "We get Pamela Aidan to write a sequel with Darcy at sea---and he's ours." Susan Kaye, author of the Frederick Wentworth, Captain books, lives on a farm in Oregon with her family. Her latest Anne and Frederick novel, a Regency romantic thriller, is set for 2013 release. Her longtime friend, Laura Hile, author of the Mercy's Embrace novels, harasses her from time to time. Together they complain, procrastinate, and prod one another to write. They share a blog with Pamela Aidan, author of Fitzilliam Darcy, Gentleman. Susan, this is brilliantly funny and so witty-it made me laugh out loud! It's just as you'd imagine they'd be. loved it - very funny. The guys belly achin' again. My, what will the do next? I'm surprised that FW has a kind word for me since I've been AWOL on all fronts writing. Thanks, Laura, for giving they boys voice and me some cover! 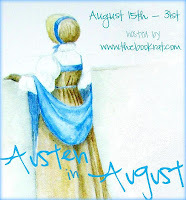 Have a great Austen in August all you out there.